The Communist Party of Denmark (Danish: Danmarks Kommunistiske Parti, DKP) is a communist political party in Denmark. DKP was founded on November 9, 1919 as the Left-Socialist Party of Denmark (Danish: Danmarks Venstresocialistiske Parti, VSP) through a merger of the Socialist Youth League and Socialist Labour Party of Denmark, both of which had broken away from the Social Democrats in March 1918. The party assumed its present name in November 1920, when it joined the Comintern. Currently, the DKP is represented in the Danish parliament through the Red-Green Alliance. 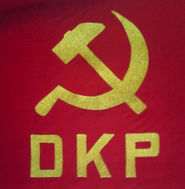 DKP is one of three active communist parties in Denmark. On 9 April 1940 Germany invaded Denmark. For the first 14 months of German occupation, DKP was allowed to continue operating legally. Following the German invasion of the Soviet Union on 22 June 1941, however, the party was outlawed when the Communist Law was signed into law. More than 300 communists were interned. A national unity government was formed by the other major parties, which cooperated with the Germans, including in the outlawing of DKP. DKP fell out of parliament once again in the 1979 Folketing election, and suffered several high-profile defections in the waning years of the Soviet Union, including from party Chairman Ole Sohn, who was expelled in 1991 and later join the Socialist People's Party. In 1989, DKP joined with two other left-wing parties, the Left Socialists, and the troskyist Socialist Workers Party to form the broad-based Unity List – The Red-Green Alliance (Danish: Enhedslisten – De Rød-Grønne). Gert Petersen, then-Chairman of SF claimed at the time that cooperation between such diffuse ideological currents would fail. Instead, the Unity List achieved parliamentary representation in the 1994 Folketing election, winning 6 seats, 2 of which were held by DKP. This was the first time the party was in parliament since 1979. The Unity List has been represented continually in parliament since. 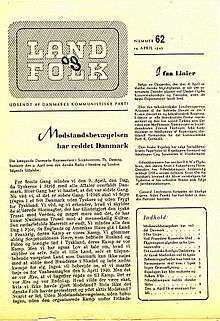 During the German occupation of Denmark, the party began publishing a clandestine newspaper called Politiske Maanedsbreve (English: Political Monthly Letters), which was soon renamed Land of Folk (English: Land and People). It was one of the most widely circulated underground papers in the country, and continued as the main press organ of the DKP until 1982. In addition, the DKP published a large number of local papers. 1 2 As the Left-Socialist Party of Denmark. 1 2 3 4 5 6 7 8 9 10 11 12 13 14 15 16 "The Great Soviet Encyclopedia: Communist Party of Denmark". USSR. 1979. Retrieved 20 November 2013. 1 2 Aksel Larsen, Taler og artikler gennem 20 år (Copenhagen, 1953). 1 2 3 4 5 6 7 8 9 10 11 12 13 14 15 16 17 18 19 20 21 22 23 24 25 26 27 28 29 30 31 32 Thing, Morten (1990). "Communist Party of Denmark and Comintern 1919-1943" (PDF). Roskilde University. Retrieved 20 November 2013. ↑ Mogens Nielsen, Socialdemokratiet og enheden i arbejderbevægelsen 1933-45 (Copenhagen 1978). ↑ Skou, Kaare R. Dansk politik A-Å: leksikon. [Kbh. ]: Aschehoug, 2007, pp. 370–371.